We got the Fed rally as c-wave of the pink b wave — which was potentially subdivided as a-b-c- === rather than 1-2-3. This chart below that we posted yesterday is looking real nice. This morning we alerted our subscribers when we bought 20 contracts of SPY puts when SPY was trading around 2064 @ $.79. Bought SPY Dec24 203.5 puts. Now, these puts are worth over $2 — an over 100% gain in one day! So basically put $1,600 worth of puts at $.79 each contract — and that $1600 I cashed out half when the $.79 became $1.81 — that’s when I sold 10 contracts. That said, we did take half of profits at around 11:15am @ $1.81. The remaining pieces are currently worth around $2.2. And we still have December 24 for expiration. The 1-2-3 count just didn’t look right to me—mostly because of the bottom pattern that formed a few days ago — it was a-b-c rather than a typical 5th wave down. My count is a little bit off — the bottom of the Fed announcement is probably (B) instead of (b) — and then the C wave up still went up to 2070 — so there was a slight adjustment. But once it started rolling over — at 2065 — I bought puts. 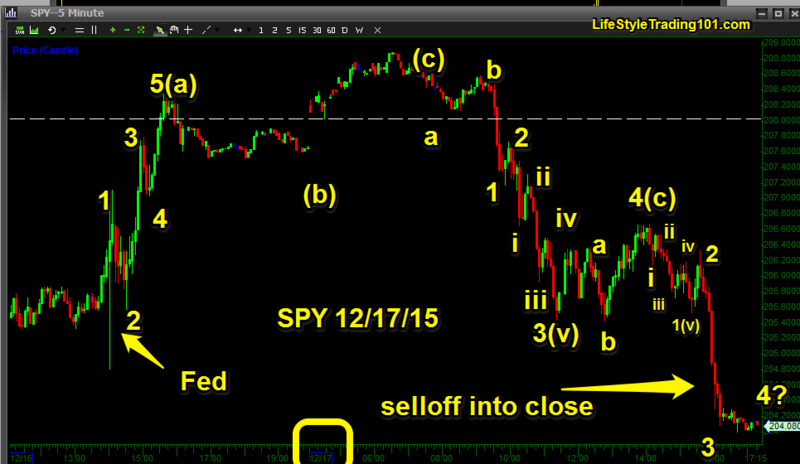 I also did a high probability call spread – betting the SPY would not get over 207.5 by next Friday. Now we are close to 204 in the SPY.